The Auctiva Emporium allows you to have a storefront that displays your eBay items. You can choose from a variety of Emporium templates that make a unique shopping experience for your customers. This tutorial will show you how to change your Auctiva Emporium template. An Emporium template is a theme-based style that can be applied to your Auctiva Emporium. Emporium templates control the way your Auctiva Emporium looks. When you start an account with Auctiva, your free Auctiva Emporium will be set up with the default template. After you change your Emporium template, you may want to consider adding a logo in the Emporium header. Read the Emporium Logo tutorial for more information. Step 1. 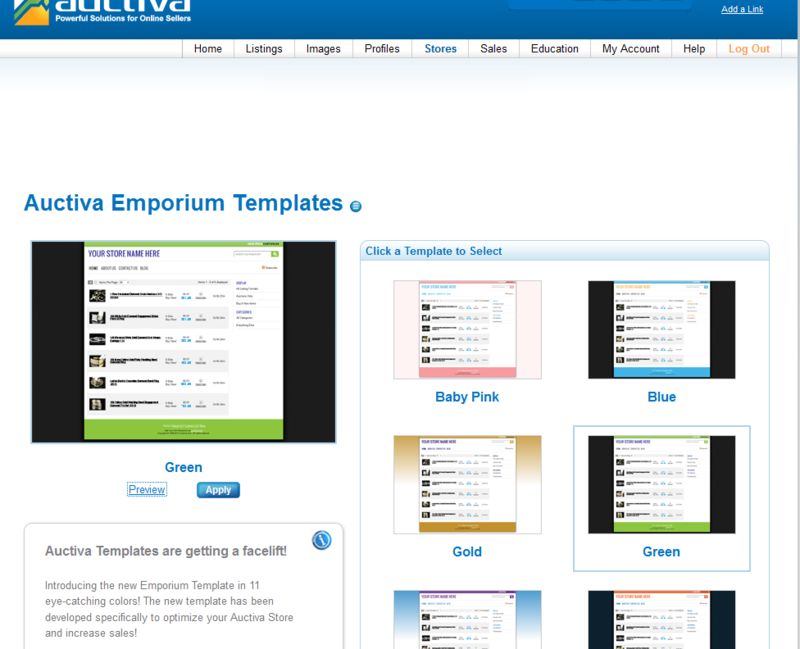 Load the Auctiva Emporium Templates page. Hover you mouse over the Stores tab and click on the "Template" link (Figure 1). The Auctiva Emporium Templates page will load. Figure 1. Go to the Emporium Templates page. Step 2. Browse Emporium templates. 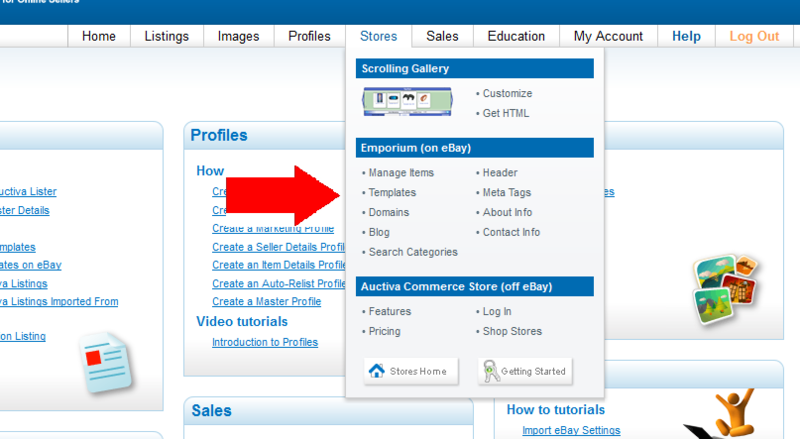 On the Auctiva Emporium Templates page, your current Emporium template will be displayed to the left (Figure 2). Click the Preview button below this template to see what your Emporium looks like. A preview will load in a separate Internet browser window. Browse the Templates page for the Emporium template you would like to apply to your Auctiva Emporium. Figure 2. Current Emporium template. To make a selection, click the template thumbnail. Click the "Preview" link to preview the Emporium. If this is not the template you want, close the preview browser and select another template. Continue to browse the Emporium templates as necessary. Click the Apply button to make your selection and apply the change. A confirmation message will display. This completes the task of changing the Auctiva Emporium template.